This week has seen two outings to the Greenwich Comedy Festival, first to see Rob Newman at the Greenwich Theatre on the Tuesday, then to see a collaboration of comedians on the Wednesday, headlined by Russell Howard, at ‘the Grounds’…a tent in the middle of the Royal Naval College grounds. Well, I say a tent…it was the kind of marquee you would expect for a wedding (but with 1,200 people crammed into it), not the most sensible set up for a comedy gig and I’m glad I was sat close to the front as I can’t imagine you had a very good view from the back near the bottle only bar. Rob Newman is a huge hero of mine. Not only is he incredibly funny, not only does he always manage to teach me a little bit of something, but he actually practices what he preaches (as far as I can tell anyway, he might have a jumbo jet on standby somewhere that I don’t know about, but somehow I doubt it). This week’s show seems to have been Rob’s first gig for quite a while, following filming commitments, novel writing and some medical issues, and it therefore didn’t entirely suprise me that there was quite a lot of old material in the set, but having never seen him perform it live before, it was still great to revisit it. The new poem/ballad of the pub quiz star was also fantastic, although not necessarily hillarious, if that makes sense. Rob went through his material on peak oil, and it’s effects on energy use and so on, and so it was a particularly beautiful moment when after the set the theatre manager jumped on stage to warn us all to be careful on the way out, as there had been a powercut downstairs. Rob immediately lept back on to the stage with a cry of “I told you! !” which was a great way to end the evening. Wednesday’s line up included Lucy Porter, Phil Kay (again) and Russell Howard. Lucy Porter is great, because she comes across as nice and sweet, but then she will say something a bit cutting, or sinister, and it seems more funny because of the juxtaposition. Phil Kay was IMHO better than at the Chapel the other day, I think he responded to the crowd better this time (although he was also possibly reigned in slightly by the sight of an eleven year old in the crowd (who takes a child that young to a comedy gig? Really!)). He particularly like stealing someone’s picnic hamper and finding new rhymes for wicker (only in Greenwich). Russell Howard is the big name though, because he’s on the television. I had seen him live about a year or two ago, and think he has improved a lot since then, with more confidence in his material and his delivery. But oh my god, can that boy sweat. It was dripping off him, his t-shirt was plastered to his skin. Someone give him a drink, because he certainly deserves it. 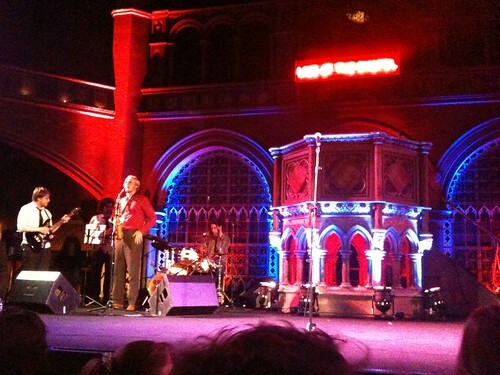 I’ve wanted to go the Union Chapel for a while now, but until this weekend had never quite managed to get around to it until this weekend (and in one of those lovely acts of coincidence, I’m actually going back again on Friday, woohoo!). Because it is a chapel, and a ‘working’ one at that, there is a very different feel to a gig held here than at a traditional comedy club. For one thing, it is such a big (tall) space, that you don’t get the problems of severe over heating that are often experienced in the dingy little basement rooms that a lot of comedy gigs find themselves in in London. Also, although there is a bar, you’re not allowed to bring alcoholic drinks back into the Chapel itself, which creates quite a different dynamic among the audience (and it’s great to see people drinking tea while at an even like this). Even better, you have to love a venue where you get a live band playing before the acts come on, and during the intervals. The act itself was the monthly Live at the Chapel comedy night, featuring the obscene (but funny) Phil Kay, the marvellous Pippa Kay (as the stroppy, hardhearted and incredibly funny Loretta Main), that man off the tv Lee Mack, everyone’s favourite drinker of pear flavoured beverages sold in glass bottles Mark Watson and fabulously compered by the joyful Alun Cochrane. It was a really good night. It’s always slightly scary when Phil Kay comes on stage, because you’re never entirely sure what he’s going to do, but he’s often actually a lot less intimidating than other more ‘regular’ comedians because although he does approach the audience, he only wants minimal input before he’s off doing something else slightly mental (but there is a risk of him jumping off the stage and kissing anything he likes the look of, and the less said about that beer bottle, the better). Pippa Evans was flaunting her probably best known character, Loretta Main, a hard hearted woman looking for love (and unwilling to let it go at any cost) with great songs, and she plays fantastically well in these songs on the difference between Loretta in her usual state (deep voiced, depressed and angry) and Loretta in happy mode (terrifyingly squeeky and pretty and perky). Lee Mack was around trying out some new material before a big tour that he’s embarking on, and while there a few jokes that fell a little flat there were some marvellous moments as well, and as a proper professional Lee doesn’t let those less successful moments pull the mood down, launching from them into something else that does work instead. Mark Watson took us on a slightly disconnected (but still very funny) ramble, about his current state of mind now that he’s going to be a father, and despite the baby not being born finding himself already making ‘Dad noises’. Although this is a subject that is not exactely the most innovative and new area of story telling, he does it very well, and we were certainly not dissapointed. And coming briefly back to the compere, Mr Alun Chochrane is marvellous, and I’m a huge fan of him, and his dead pan voice, and the way he works the audience but without being too intrusive or scary. And for his excellent way of handling the person who was filming him. I’ve just realised that this little reivew is stuffed full of brackets (but that’s okay isn’t it? I’m sure you don’t mind). Yes, I know there are a lot of these reviewy things filling up the pages here at the moment…well, it’s only going to get worse over the next month. My calendar is quite terrifyingly full at the moment. I’ll try to think of something interesting to say in between for those of you who really don’t care about the comedy. I’m a big fan of free tickets, so when the opportunity came up for us to pop along to a free Milton Jones show at the Arts Theatre in London’s glittering West End on the bank holiday monday, we jumped at it. The show was a recording for a DVD that Milton will be releasing later in the year, and is full of his strange and bizarre one-liner stories. But this dvd is not just going to be a straight forward stand up set, it will be a bit more complicated and weird than that. I’ll keep this short, for not wanting to spoil it for you when you do buy the DVD, but if you are a fan of Milton’s already, you will like this (even if you have heard a few bits and pieces before) and if you’re not a fan already, this will be a great introduction to him. (Bit warm in the theatre though). Leaving this show had a feeling of bonfire night about it: lots of people wrapped up warm all walking together in the dark and quiet night away from a single area. There is something very different about open air theatre, and more so when the show doesn’t start until midnight. There’s immediately a feeling of this being something special, something out of the ordinary. And that was definitely the case with this show by Daniel Kitson and Gavin Osborn in the middle of Regent’s Park at the Open Air Theatre… the third and final in a series of late night story and song. As a venue the open air space provided a perfect backdrop for stories set at midnight, perfectly complimenting the mood that Gavin and Daniel set. Daniel Kitson may not be widely known among the general public, but as a winner of numerous awards over the years, he is well known among comedy fans and comedians alike. He is a comic craftsman, with a fantastic way with words and the relationship between him and Gavin works perfectly. The story that he told during Saturday’s show was a story within a story, a tale of the relationship between a father and son intermingled with a story about a town where retired assassins live out their days drinking tea and playing the clarinet. And in between you have Gavin’s songs, each one painting a beautiful snapshot of people and relationships and times and places. If I were giving shows ratings, this one would definitely get 5 stars. I’ve been to The Hob quite a few times now, and it makes for a very good night out. Opposite Forest Hill station, the downstairs pub is nice and friendly, and the upstairs comedy venue (with its own bar, an important fact) is great for any type of comedy that you fancy seeing. Saturday was the first time to the hob since starting to work through my list. The evening kicked off with a realy good set by Chambers & Nettleton. I’m not entirely sure how the describe this duo of feisty northern women, but I thoroughly enjoyed their slightly mental banter and I do love it when you can see that the acts are enjoying themselves too… I think that really helps with the feel of the gig. Next act up was a newcomer going by the name of Taff. He only did a short set, perhaps about 5 minutes, but it showed good promise. And you can definitely see what he means when he describes himself as Marty Feldman’s Afghani cousin. Taff was followed by Glazz Campbell who had a bit of a hesitant start before getting into his stride and enjoying some good (read bad) puns. Headlining the evening was Andrew Bird. And for some reason, I’m having a bit of a blank mind as to what he was actually like…but I did laugh a lot. MCing the whole shebang was Mark Felgate, who did the job very well… working with a small audience he was forced to pick on a few audience members repeatedly, but did this in a way that didn’t feel intimidating at all. He also through in a few clever little ventriloquism moments that worked well and I would be really interested in seeing him do a proper set. The first stop on my attempt to visit all London comedy venues took place yesterday, taking us out to the deepest darkest reaches of North London – Hornsey in fact to Downstairs at the King’s Head. We knew we had definitely reached the right venue when we walked in and saw Barry Cryer and Ronnie Golden sat at a table together, discussing set lists. The King’s Head is quite a nice pub (and makes a good fish finger sandwich) and the comedy venue itself, as you would guess from the title, is downstairs. Quite an intimate venue, and I would recommend getting there when the doors open to ensure good seats (we were sat right at the front, and it was marvellous). For those who don’t know, Barry and Ronnie often get together to do a comedy show based on a combination of funny songs, Barry’s marvellous collection of jokes and Ronnie’s infinitely malleable voice. The end result is something absolutely hillarious and I thoroughly recommend it to anyone … they’re heading up to the Fringe shortly, if you are there make them a must (they’re on at the Gilded Balloon). Yesterday’s set, a preview for the Fringe, was a good combination of old favourite songs (such as Stannah Stairlift and Peace and Quiet) and newer material as well. It was actually a rescheduled gig, Barry having been ill for the previous planned date but that didn’t slow him down at all (“But then,” he tells us, “I’m a hypochondriac…my gynecologist told me so”). The songs are hillarious, and their interaction between Barry & Ronnie is marvellous. And watch out for Ronnie’s yodelling. If you can’t make it to see them, spend a tenner and get the album (Rock and Droll), it’s worth every penny. A new ongoing project (very ongoing, no foreseeable end in sight) is to go and see a show at every comedy venue in London. Obviously there are lots of venues in London that pop up and disappear again so, I’m working on the basis of the London list as on Chortle today, but will adapt the main list if I become aware of new information (feel free to let me know). I’m also working from this point forward, and will not be counting any of the venues that I’ve already been too. I’ll try to keep you up-to-date as I go…this could be interested (or not, we’ll see).